Stories for Unique Families: Upcoming Book Launch! The wait is finally over! Australia's first poly/queer children's book "Raf and the Robots" is being launched at Hares & Hyenas bookshop (Fitzroy, Melbourne) Sunday 28th September from 5.30pm. Let someone else feed your kids and read to them before bed! Bring them along to our special evening launch (in their pyjamas if you wish!). - Finger food, free drinks & robot-led* activities (for young and old) from 5.30pm. - Speeches by the author and special guests from 6.15pm. 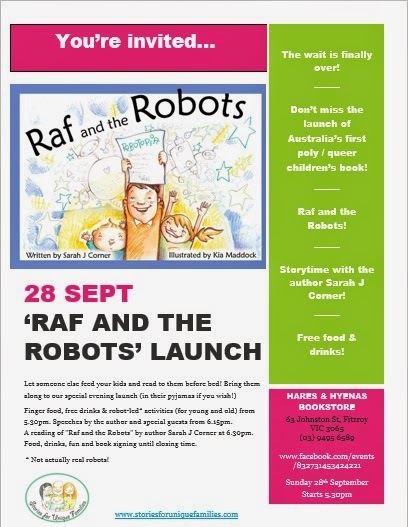 - Storytime - a reading of "Raf and the Robots" by author Sarah J Corner at 6.30pm. - Food, drinks, fun and book signing until closing time. Can't wait to celebrate with you all! * Not actually real robots! Click here to visit our launch event page on Facebook!